It’s the final Swiss Round for Day 1 of YCS Salt Lake City! We’ve got Cesar Alcaraz, playing Mekk-Knight Invoked, up against Joseph Linch’s Zefras! 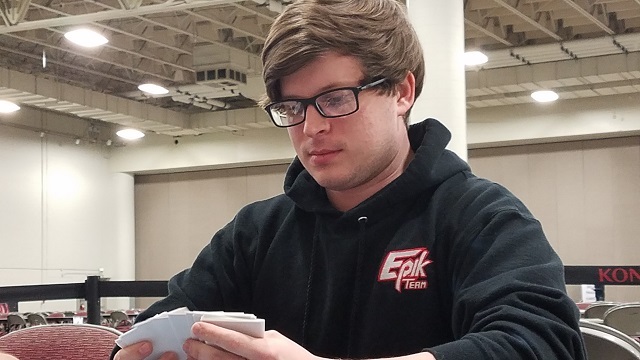 Both of these Duelists have an undefeated record so far – going into Day 2 with that record intact will be key to making it to the Top Cut. It’s time to Duel! Linch played first in Duel 1. He played Dragon Shrine, and Alcaraz negated it with Ash Blossom & Joyous Spring. He played Mythical Beast Master Cerberus in his Pendulum Zone, adding Mythical Beast Jackal King to his hand. He played it and used it to Special Summon Master Cerberus. He Normal Summoned Purple Poison Magician, and Link Summoned Heavymetalfoes Electrumite, putting Astrograph Sorcerer in his Extra Deck. He played another Astrograph in his Pendulum Zone, then used Electrumite to destroy it and add the first Astrograph to his hand. He Special Summoned Astrograph, which added a Jackal King to his hand, and Electrumite let him draw a card. Alcaraz had a hand of two Terraforming, Pot of Desires, Magical Meltdown, and Mekk-Knight Blue Sky. He Set Terraforming in the same column as Electrumite, then Special Summoned Blue Sky. He added Mekk-Knight Purple Nightfall to his hand. He activated Terraforming from his hand, getting Magical Meltdown, and played that to get Aleister the Invoker. He Set Pot of Desires in the column with Astrograph, and Special Summoned Purple Nightfall. He played Aleister next, and Linch conceded! He revealed his hand of two more copies of Dragon Shrine – he would have no way to get back into the Duel after Alcaraz was finished! Linch chose to play first again in Duel 2. He led with Foolish Burial, sending Supreme King Dragon Darkwurm to the Graveyard. He Special Summoned it, adding Supreme King Gate Zero to his hand. He activated Zefraath in his Pendulum Zone, which put Zefraniu, Secret of the Yang Zing in his Extra Deck. He played Ritual Beast Tamer Zefrawendi, putting Zefraniu in his hand. He Link Summoned Heavymetalfoes Electrumite, which put Chronograph Sorcerer in the Extra Deck. Electrumite destroyed Zefraath to get Chronograph to his hand, and he drew a card. He played Chronograph and Gate Zero in his Pendulum Zones, and Pendulum Summoned Darkwurm and Zefrawendi from his Extra Deck, along with Purple Poison Magician and Zefraniu from his hand. With his Zefra effects he added Zefraath and Zefra Providence to his hand. He used his two Zefras to play another Electrumite, which placed Astrograph in the Extra Deck. He destroyed Gate Zero to get Astrograph to his hand, but didn’t Special Summon it. He used his two Electrumites to play Zefra Metaltron, then used Purple Poison and Darkwurm to play Evilswarm Nightmare in Defense Position. He played Zefra Providence to get Zefra Divine Strike. He Set two cards, each in separate columns from the rest of his cards. He had left only one card in each of his columns this way. Alcaraz had a hand of Mind Control, two Invocation, two Spellbook of Secrets, and a Ghost Reaper & Winter Cherries he just drew. He played Spellbook of Secrets, adding Spellbook of Knowledge to his hand. He played Spellbook of Knowledge next, and Linch negated it with Divine Strike. Alcaraz used Mind Control to take Zefra Metaltron, but Linch flipped his second Divine Strike! Alcaraz Set the rest of the cards in his hand. Linch played Zefraath in his Pendulum Zone, then Pendulum Summoned Astrograph from his hand and Gate Zero from his Extra Deck. He used them to play Odd-Eyes Absolute Dragon. He used Chronograph’s effect next, and Special Summoned Timegazer Magician. 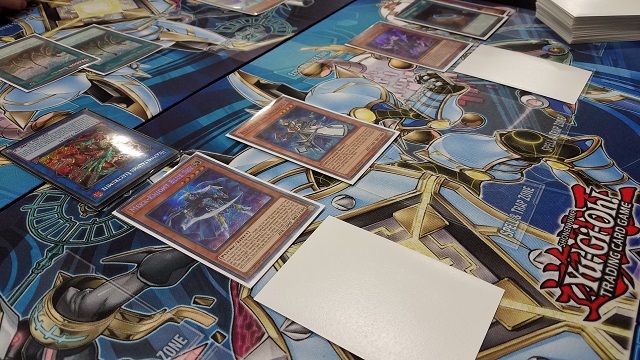 He used Timegazer and Absolute Dragon to play Underclock Taker, and Absolute Special Summoned Odd-Eyes Vortex Dragon! 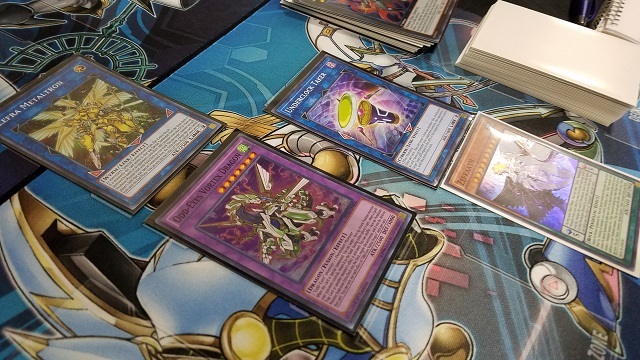 Vortex Dragon destroyed Ghost Reaper, then Metaltron and Underclock Taker attacked directly. Alcaraz drew Mekk-Knight Purple Nightfall. He flipped up Spellbook of Secrets, and it was negated by Vortex Dragon. He Special Summoned Purple Nightfall, Linch used Nightmare’s effect, and Alcaraz banished Purple Nightfall to add Blue Sky to his hand. He Special Summoned it in the same column as Metaltron and Vortex Dragon. Blue Sky was turned face-down by Evilswarm Nightmare, but its effect still put Mekk-Knight Indigo Eclipse and Purple Nightfall in Alcaraz’s hand. He Special Summoned Indigo Eclipse in Defense Position. Linch turned Vortex Dragon to Defense Position. Metaltron destroyed Indigo Eclipse in battle. Alcaraz drew Pot of Desires, and returned Purple Nightfall to the field. He flipped up Blue Sky, then activated Purple Nightfall’s effect to banish Blue Sky and get another Blue Sky to his hand. He Special Summoned Purple Nightfall from his hand, combining both Purples for Hieratic Sun Dragon Overlord of Heliopolis! He Set Pot of Desires in the column with Nightmare, then Special Summoned Blue Sky in the same column. He added his final Purple Nightfall to his hand. Heliopolis attacked Zefra Metaltron, and Linch used Zefra Providence to save it from destruction. Linch turned Vortex Dragon and Nightmare to Attack Position. He used Zefra Providence to get a Zefraath to his hand. He used Underclock to weaken Heliopolis, sending Vortex Dragon to destroy it. He had Nightmare attack and collide with Blue Sky, and when Nightmare was destroyed he Special Summoned Astrograph Sorcerer from his hand. Metaltron, Underclock, and Astrograph attacked to even the score! Alcaraz chose to play second in Duel 3. Linch started with Oracle of Zefra, and Alcaraz negated it with Ash Blossom & Joyous Spring. Linch played Supreme King Dragon Darkwurm, adding Supreme King Gate Zero to his hand. Alcaraz had Mind Control; Spellbook of Knowledge; Gameciel, the Sea Turtle Kaiju; Magical Meltdown; and Terraforming. He played Meltdown to get Aleister the Invoker, and that to get Invocation. He used Spellbook of Knowledge, drawing Ghost Reaper & Winter Cherries and another Magical Meltdown. He immediately used Ghost Reaper, banishing every copy of Heavymetalfoes Electrumite. He played Mind Control next, then activated Invocation to fuse Aleister with Ghost Reaper for Invoked Caliga. He then stacked Caliga with the pilfered Darkwurm for Tornado Dragon! It attacked directly. He used Invocation’s effect in the Graveyard before finishing his turn. Alcaraz drew Spellbook of Secrets. He played Aleister to get Invocation, then used Spellbook of Secrets to get Spellbook of Knowledge. He used Knowledge with Aleister, drawing Indigo Eclipse and Magical Meltdown. He Set Terraforming in the same column as Linch’s monster, then Special Summoned Indigo Eclipse. He played a new Magical Meltdown, getting another Aleister to his hand. He Tributed the Set Purple Poison Magician to Special Summon Gameciel to Linch’s side of the field. He detached Caliga from Tornado Dragon, destroying Oracle of Zefra. Indigo Eclipse destroyed Gameciel in battle, and Tornado Dragon attacked directly. Alcaraz drew another Ghost Reaper & Winter Cherries. He played his third Magical Meltdown, getting Aleister, and played that to search for Invocation. 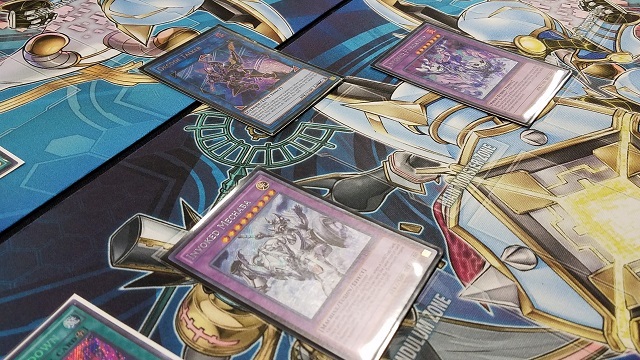 He used Aleister, Indigo Eclipse, and Tornado Dragon to play Decode Talker! Then, Invocation fused Aleister with Indigo Eclipse for Invoked Mechaba! His second Invocation fused Aleister with Ash Blossom for Invoked Purgatrio! With his three monsters, he moved to the Battle Phase to finish the Match! 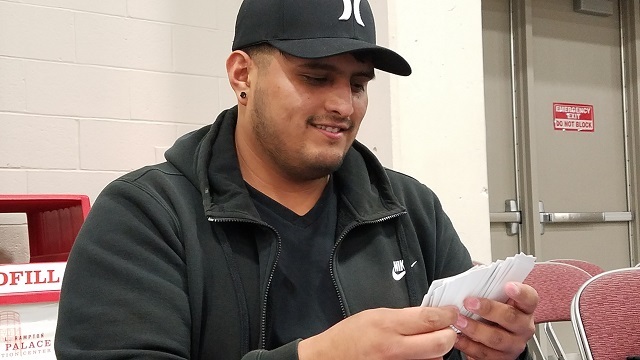 Cesar Alcaraz wins with Mekk-Knight Invoked!